Thanks to Dr. Ankur Sangoi, El Camino Hospital, California (USA) for contributing this case and Dr. Hillary Z. Kimbrell, Myriad Genetics, Inc., Utah (USA) for writing up the discussion. To contribute a Case of the Week, follow the guidelines on our main Case of the Week page. (1) We are excited that January has started 2017 off with a bang! Last month, we saw the following record numbers: 18,525 sessions (visits) per day (up 36% from last year); 574,275 total sessions (visits); 219,321 users; 1,504,401 page views; 56,158 visits to the Jobs page; and 12,020 visits to the Conference page. We continue to convert our topics to the new, cleaner format and to fix broken links, and hope that this format is making PathologyOutlines.com even quicker and easier to use. (2) We have posted past versions of the Jobs, Fellowships and Conferences pages, as of December 1, 2016, January 1, 2017 and February 1, 2017, and have posted them as far back as January 2012. If you need to look up a previously posted, we maintain these files as of the first of each month (or close to it). The format is the name of the file, plus yyyymm, where yyyy is the year and mm is the month. So, for example, jobs posted as of April 1, 2016 can be seen at http://www.pathologyoutlines.com/jobs201604.html. Please contact us with any questions via email at CommentsPathout@gmail.com or via phone at (248) 646-0325. (3) New CME courses from ARUP are posted here. A 45 year old woman presented with a 5.3 cm posterior mediastinal cyst, which was excised. Which of the following is NOT a feature of mediastinal Müllerian cysts? 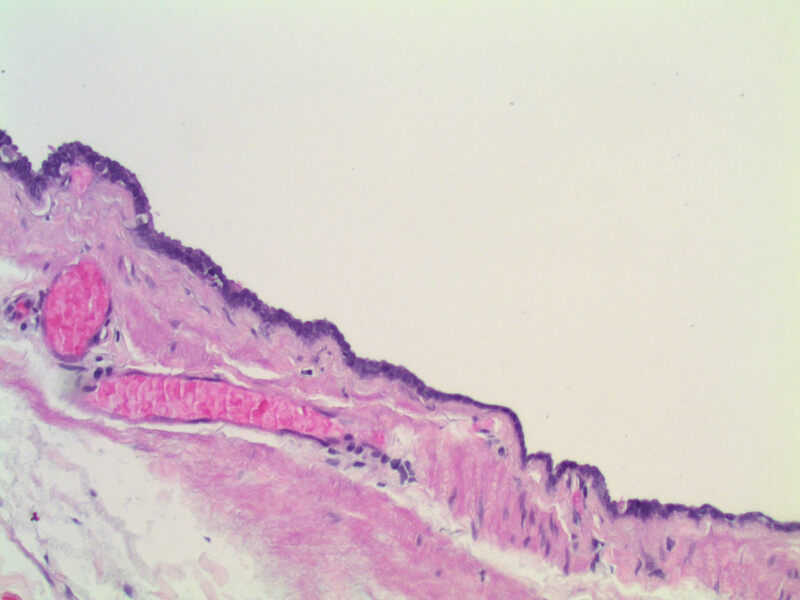 Müllerian cysts are rare outside of the genital tract, but they can arise in the retroperitoneum and posterior mediastinum, and similar appearing ciliated cysts can arise in the skin and subcutis (Virchows Arch 2005;446:82, Case Rep Med 2016;2016:2487820). Their origin may be remnant Müllerian tissue, endosalpingiosis or metaplasia of other tissue types. Of interest, but perhaps coincidental, is a reported mediastinal Müllerian cyst in a woman with a prior mediastinal teratoma (Ann Thorac Cardiovasc Surg 2011;18:39). In a French study, mediastinal cysts with Müllerian differentiation represented 5.5% (9/163) of non-neoplastic mediastinal cysts collected over 23 years. Mediastinal Müllerian cysts are found only in women, who are usually peri-menopausal. 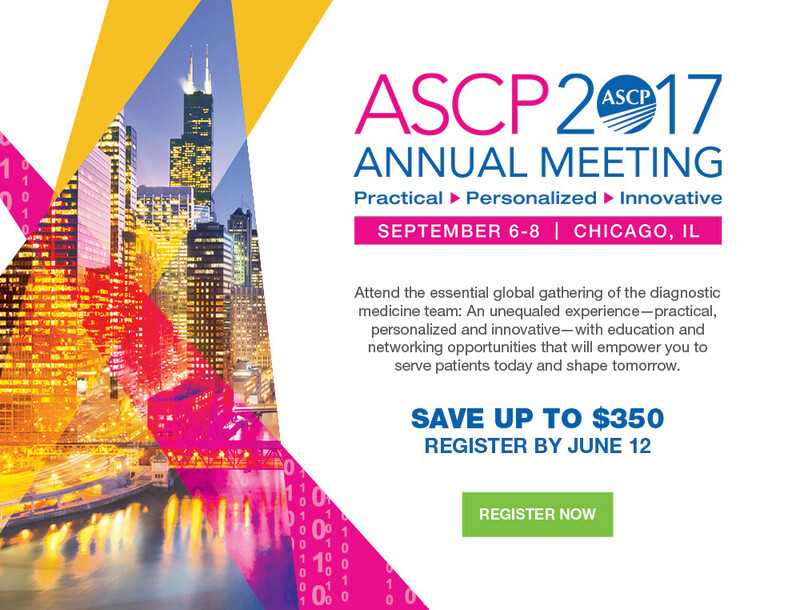 The cysts are typically paravertebral and are often mistaken for neurogenic tumors clinically. They may be asymptomatic or cause chest pain, cough and dysphagia (Ann Diagn Pathol 2007;11:417). Typically there is only one cyst, but a case with multiple, bilateral cysts has been reported (Ann Thorac Surg 2015;100:1898). 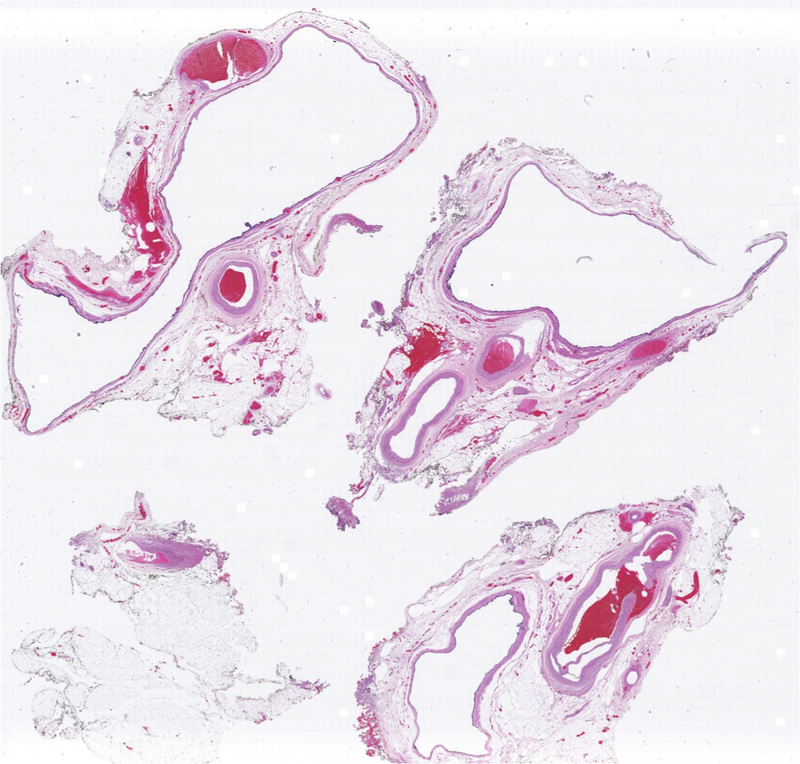 Müllerian cysts are thin walled and serous, with lining cells that resemble normal fallopian tube – ciliated cells with interspersed secretory cells and intercalated (peg) cells. 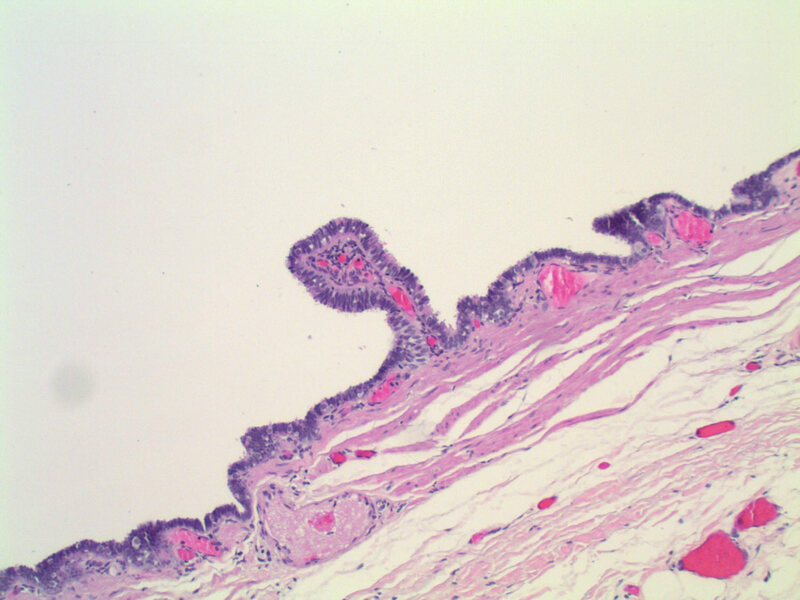 Areas with small cuboidal lining cells can also be seen. 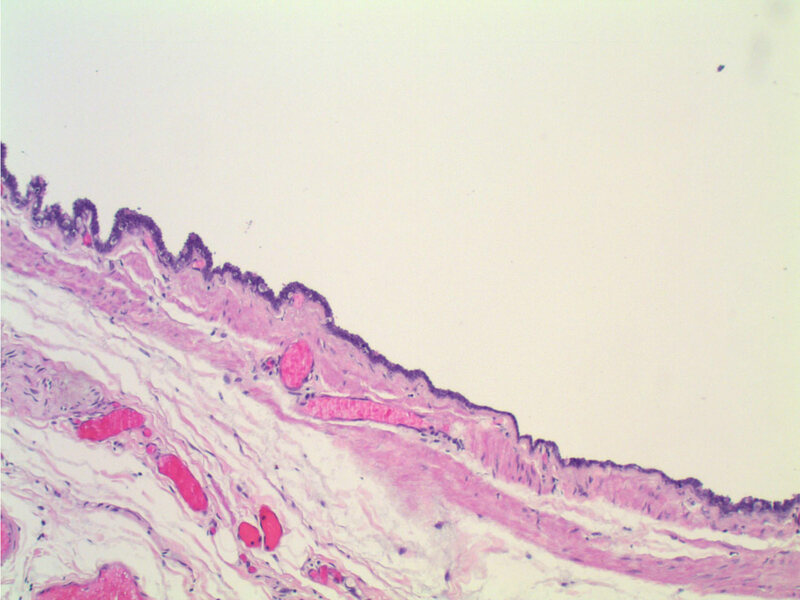 Within the wall is a circumferential layer of smooth muscle. Goblet cells, cartilage and glandular structures are not present, which helps to differentiate them from bronchogenic cysts, their main differential diagnosis. Immunohistochemistry can also help in the distinction, as the Müllerian epithelium is positive for ER and PR. 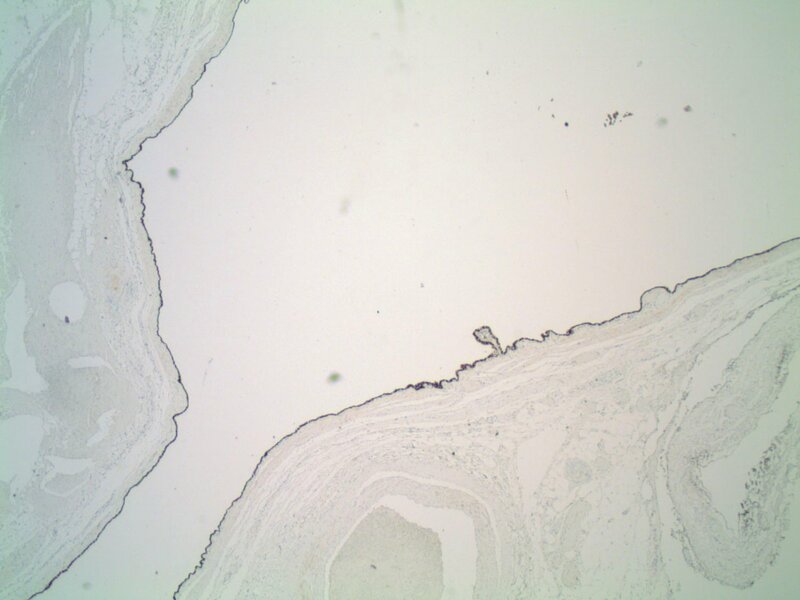 The smooth muscle cells in the wall can also stain positive for ER and PR. Bronchogenic cysts, on the other hand, will be negative for ER and PR (Virchows Arch 2005;446:82, Ann Diagn Pathol 2007;11:417). 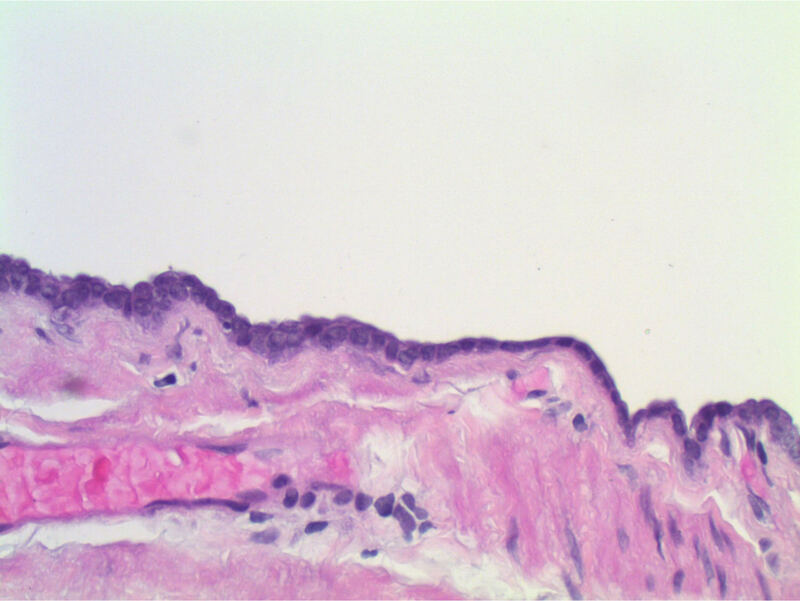 Other markers that are positive in Müllerian epithelium, such as PAX8 and WT1, are also positive in cysts with Müllerian differentiation (Case Rep Med 2016;2016:2487820, J Thorac Dis 2013;5:E8). 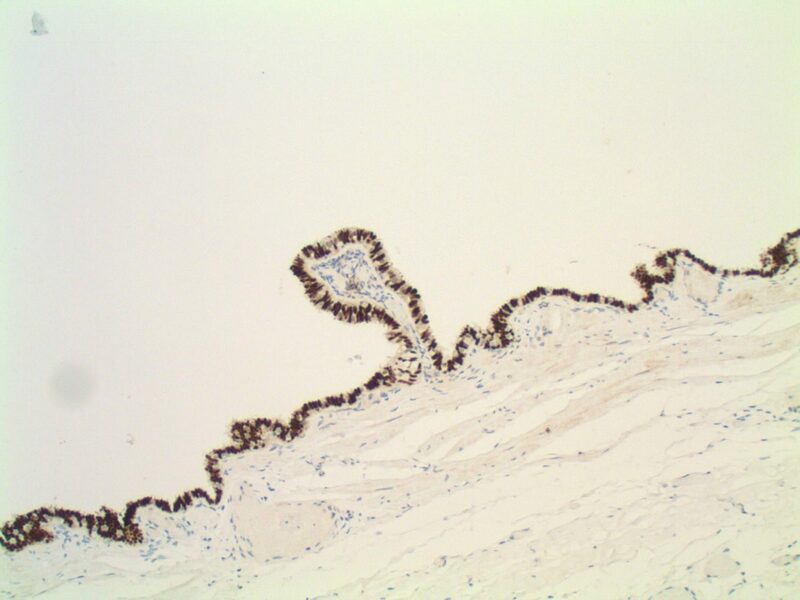 Stains that have been reported negative in mediastinal Müllerian cysts include CK5/6, calretinin, CK20, CEA and CD10 (Virchows Arch 2005;446:82, Ann Diagn Pathol 2007;11:417). For the current case, both PAX8 (see image) and ER were positive. Mediastinal Müllerian cysts are benign and there are no reports of recurrence after excision (usually performed thorascopically). 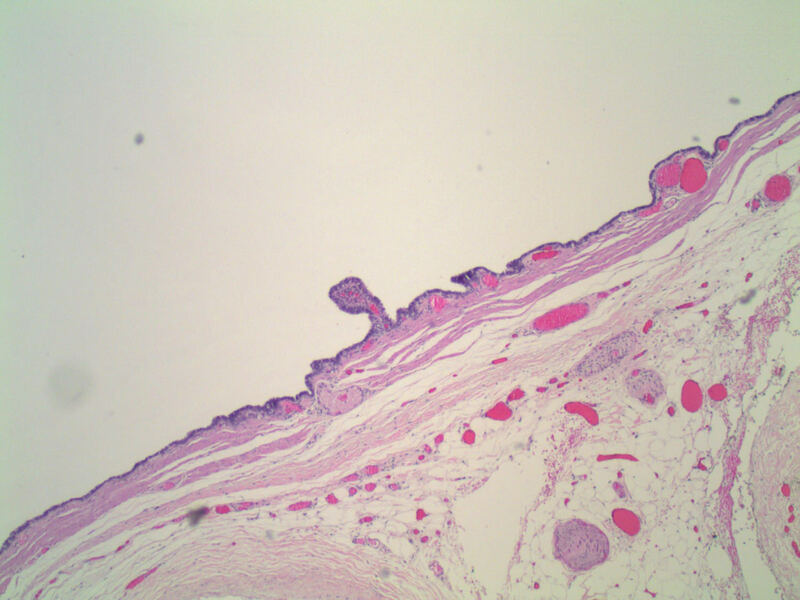 D. Müllerian cysts should not have cartilage in the cyst wall.